One would think that nearly two dozen of the world's biggest resorts populating Las Vegas Boulevard, few vacationers would ever venture off The Strip for fun and excitement. But think again. Another local zip code, 89101, is fast becoming a preferred hang-out for vacationers from around the world. Downtown Las Vegas is the "Old Vegas", with historic buildings hoisting legendary casino names like Golden Nugget, Four Queens and Binions. Every Downtown venue puts out a welcome mat to vacationers, reviving a seemingly bygone era of hospitality. But it is the fact that stickmen and servers alike Dontown treat vacationers like family that helps distinguish Downtown from a less personalized visitor experience served up on The Strip. The tireless efforts of Mayor Oscar Goodman and a legion of new casino owners, restaurants and retailers, has fostered a new vibrancy in Downtown Las Vegas that's attracting vacationers to patronize the area's many attractions. Those vacationers are joining Vegas locals to create a robust real estate market Downtown, too, ensuring a new era of commerce and promise for the city's oldest playground. For example, just east Fremont Street Experience, is the opened Aerial Gallery at El Cortez Hotel. Located within the Fremont Experience District, this is one example of the thriving arts cultural scene Downtown. The El Cortez will also be an official stop during "First Fridays". 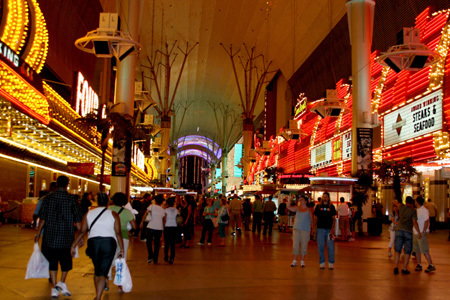 And nightlife is on the upswing, too, many hot spots have opened on Fremont Street and the surrounding areas. Here is the casinos you will find on Fremont Street: Plaza, Main St. Station, Golden Gate, Las Vegas Club, California, Golden Nugget, Binions, Four Queens, Fremont, Fritzgeralds, Gold Spike and El Cortez. Click here to download your Las Vegas Downtown map now ! Downtown is where it all began, and, if Mayor Oscar Goodman has his way, it's where it all will begin again. We bring you all the "must-sees" from shows, restaurants, gaming as well as historical snapshots to give you that 'Old-Vegas' downtown state-of-mind appeal before it forever disappears and gets replaced by spanking-new skycrapers. For now, it's still one of the best ways to relive the days of Vegas, back in the day. Golden Nugget still has historical significance, through they're also keeping-up with the times by adding newer and modern shows like the smash Broadway hit, DEFENDING THE CAVEMAN, a play about the ways men and women relate that will have you roaring with laughter. Over the Plaza, Vintage Vegas is at its best with VIVA LAS VEGAS - the showgirls, the song and dance members, the feather boas and headresses... you will find it all here at afternoon. It's a little bit of country-vibe at Fritzgerald's with COUNTRY SUPERSTARS TRIBUTE, a live country experience featuring some of the best tribute artists bringing to life the music and performances of Brook & Dunn, Shania Twain, Faith Hill and more. 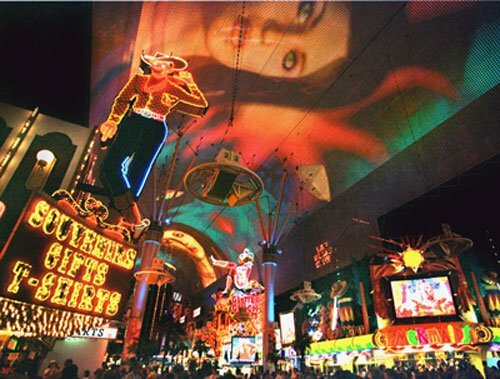 When the sun sets, it's hard to miss the FREEMONT STREET EXPERIENCE - a seven block, open-air, pedestrian mall with live entertainment, concerts and Viva Vision, the largest screen on the planet with laser light shows nightly, every hour or so, starting at 6pm. Best of all ? It's free. Lots of gambling firsts in 'Glitter Gulch' , where slots are purported to be "looser" and most of the casinos serve as training ground for future dealers - a place where they can get their feet whet. Various accounts on Las Vegas' gambling history indicates that Nevada was the first state to legalize casino-style gambling, although it had to outlaw gaming in the first decade of the 20th century. In October 1910, an anti-gambling law came into effect in Nevada, though this lasted less than three weeks as underground games flourished to accommodate die-hard gamblers. While gambling took place illegally for many years, it was officially legalized in March 1931.